If you’re watching your weight, try this delicious salmon recipe. Salmon makes a perfect main meal that can be used as part of your TurnTrim weight-loss diet. You could even cook extra salmon – use it as a centrepiece for lunch on the following day. Salmon is a great source of protein – it is also high in healthy fats called omega-3s. Serve with plenty of vegetables and a dressed green salad, and your meal becomes a powerhouse of beneficial antioxidants and healthy nutrients. Add the frozen salmon to a roasting dish. Drizzle with oil. 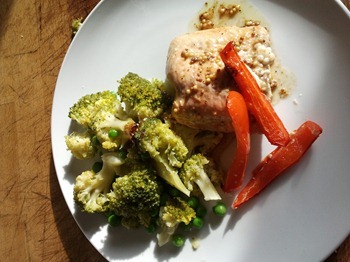 Rub wholegrain mustard into salmon fillet. Squeeze some fresh lemon juice over the top. Add lots of black pepper. Slice some red pepper and sprinkle over your salmon. Roast at Gas Mark 5 (190 deg C) for 25 minutes. Serve with boiled or steamed vegetables and a large green salad. If you enjoyed this recipe, why not like us on Facebook or follow us on Twitter for regular healthy recipes and weight-loss tips. 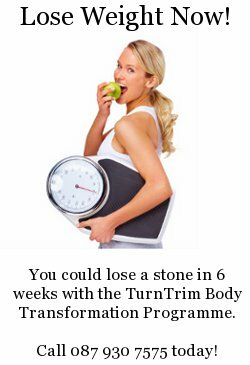 If you’re in Co. Clare, call us on 087 930 7575 to find out about our weight loss services.